Gift Guide - GWU Campus Shop! Looking for a gift for a family member, friend, alumni, or current GW student? Doing your Christmas shopping and need some great ideas? Look no further! The Campus Shop has the perfect gifts to complete your shopping list. With easy access online shopping, your gift can be delivered right to your campus post office box or front door! This GWU Gift Guide will have everyone, from aunts to uncles, cousins and siblings, and even mom and dad, showing off their Runnin’ Bulldog pride. This pullover is perfect for wearing over an outfit to lounge around or to wear out to the movies, dinner, or anywhere else your Christmas plans may take you. To find this pullover, or to see more options, click the link below. Another option is this crewneck Under Armor pullover. Warm and cozy, this sporty option is perfect for that one cousin that has everything - except for this! For more colors and other pullover options, click the link below. An engraved bulldog charm perfect for sisters, moms, aunts, and grandmothers! This bangle bracelet is a stylish way to accessorize any outfit. These hats make a great gift for the sports fan in your life. Pick your sport: basketball, baseball, football, volleyball, lacrosse, swimming, softball, cheerleading, and soccer - these hats make the best all-purpose gift. 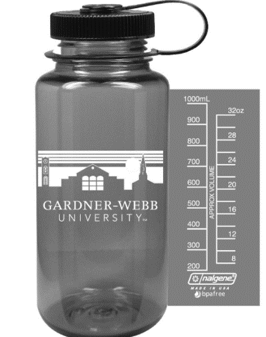 This Nalgene water bottle is a perfect, practical gift. Everyone needs a water bottle! If you are feeling particularly Christmas-y, you can fill this with their favorite candy, fun socks, or other small things that make this gift extra thoughtful. If you’ve made it to the end of this post and have more folks on your Christmas List to buy for, don’t forget to check out the Campus Shop’s full website.